Schools can also be better prepared for an emergency with the addition of Smart911Facility. By creating a profile for their facility, school administrators can make responders aware of on-site contacts, building layouts, access points and even the locations of athletic fields and parking lots. Anytime any phone calls 9-1-1 from within the boundaries of the school facility, that information will also be available to facilitate a fast response. 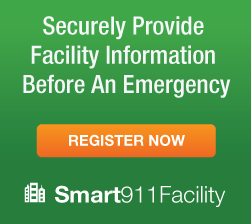 Schools and other commercial buildings and facilities can create a profile at www.smart911facility.com. Families can sign up for free today at www.smart911.com and provide as much information as they would like within their household Safety Profile. Smart911 is private and secure and the information is only used in an emergency. Smart911 is a national service available in over 1,500 communities across 40 states. Raceland, LA January 13, 2015 – Tuesday, January 13 will mark the 19th anniversary of AMBER Alert Awareness Day, which honors the day nine year old Amber Hagerman was abducted while riding her bicycle in front of her family’s home in Arlington, Texas, and found murdered two days later. In recognition of this day, Lafourche Parish Communications District is encouraging parents to do three things to keep their children safer. Determine a password with your children. If you ever need to send someone to pick them up or when an emergency happens, they can ask that person for the password to ensure it is safe to go with them. Be aware of how much information about your child is available. Do not add their names to backpacks or post information about them, including name, address or school on social media websites which can be viewed publically. 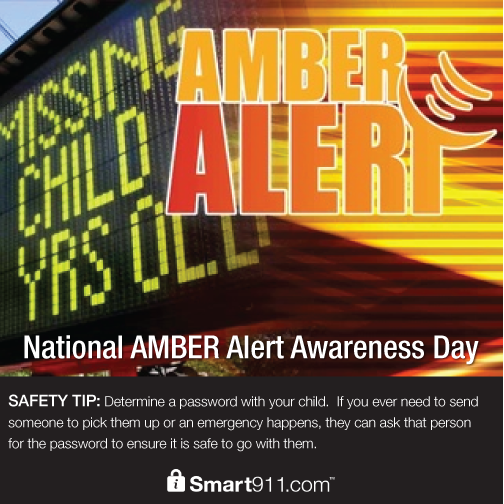 Create a free, private and secure Safety Profile for your household at www.smart911.com which can include current photos and physical descriptions of your children. If a child goes missing and a family member calls 9-1-1, their Safety Profile will be displayed to the dispatcher allowing them to share the child’s photo and description to responders in the field immediately. According to the National Center for Missing and Exploited Children, the first three hours are the most critical when trying to locate a missing child. When a child is reported missing it can take an hour or more just to distribute a current photo to law enforcement officers in the field. Smart911 is available to all residents through Lafourche Parish Communications District and public officials encourage all families to take advantage of the free service by signing up today. A mother in Arkansas experienced the benefits offered by Smart911 when she received a call that her daughter did not get off the bus at daycare. Frantic, she dialed 9-1-1 and her family’s Smart911 Safety Profile appeared, including her daughter’s photo and description. The call taker was able to use that information to send deputies to the scene immediately. The actual 9-1-1 call can be heard here: http://youtu.be/7Nfwol3Zi8k“As a parent, having a child go missing can be the most terrifying moment: you may not be able to think straight, remember critical information or even communicate effectively,” said Chief Warren Vedros. “Smart911 can have a dramatic impact on these situations and we encourage families to be proactive about safety and sign up today”. Introduced more than four years ago by Rave Mobile Safety, the trusted software partner for campus and public safety, Smart911 is active in 38 states and more than 1,000 communities. It has been credited with positively impacting emergency situations across the U.S., including the missing child case in Arkansas, and saving lives, such as a heart attack victim in Nashville and a house fire victim in Michigan. With the Thanksgiving Holiday approaching, residents are eagerly making travel plans and beginning hosting preparations. Lafourche Parish Communications District officials offer Safety facts and tips for this holiday, and the best ways to be a safe host, courtesy of Smart911. •Thanksgiving is the peak day for home cooking fires, and two of every five home fires start in the kitchen, so keep your kitchen safe this holiday by staying close when frying, or broiling. •If you are deep frying your turkey this year, be sure it is completely thawed before cooking. •Keep anything that can catch fire- pot holders, towels, food packaging- away from the stovetop. Always keep a lid nearby to smother small fires. •Automobile crashed cause by deer, alcohol and bad weather are more common during Thanksgiving week thank the rest of the year. Stay alert, check road conditions before leaving the home and always have a designated driver. •There are most vehicles travelling the roads during Thanksgiving week, and more chances for an accident to happen. Buckle Up, and be sure everyone in the vehicle has a seatbelt fastened as well. While you can’t always predict an emergency, you can be prepared. Sign up at www.Smart911.com or if you have already signed up for Smart911 be sure to log in to update or confirm the information in your Safety Profile. Smart911 is a free service which allows citizens to create a Safety Profile for their household of any information they want 9-1-1 and first responders to have in an emergency. Once signed up, each account must be confirmed every 6 months to ensure the information is accurate and up to date. Visit www.smart911.com to sign up or to update your account. January 28, 2014 Comments Off on Sign up for a Smart911 Profile! WHAT: With ice storm warnings in effect, all citizens of Lafourche Parish are urged to register for the public safety service, Smart911, which is available to all Lafourche Parish Residents. Smart911 allows citizens to create a free, secure Safety Profile online that contains important information about their household. Public safety officials can quickly leverage this data to identify potential challenges and expedite emergency response and recovery efforts during events such as ice storms, as well as to facilitate response to 9-1-1 calls. WHY: Smart911 allows residents of a community to share information about themselves and their families with public safety officials. This can include general data on a household – ranging from the identity of residents, locations of bedrooms and utility information – to specific details about disabilities and medical conditions requiring such things as oxygen, dialysis and more. WHEN/WHERE: Lafourche Residents can register for Smart911 online immediately and for free at https://www.smart911.com.